We are up to our elbows in lavender! As we progress with harvesting, the fields are slowly turning from purple back to green. Loads and loads of lavender are being harvested each day. Every extra drying area on the farm is full of our freshly harvested 'Provence' lavender drying for later use. One day we brought a camera out to the fields to show you how we do it, so... Come take a tour with us...click to start. 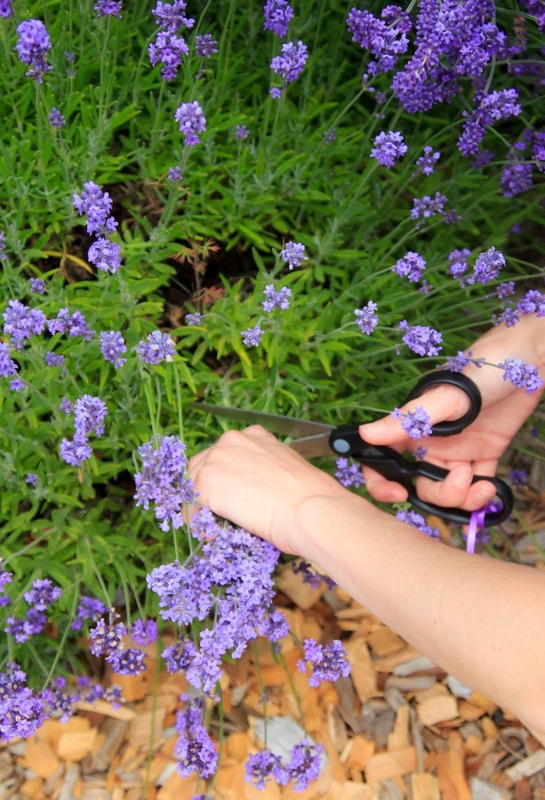 Grasp a handful of stalks (be sure to leave at least 2-3 inches of green on the plant) and cut them with your garden shears or scissors. Bundle the stalks with rubber bands, bundles should be no more than 1.5 inches in diameter to keep the stalks from mildewing. Unfold a paper clip hooking one end through the rubber band. Hang the opposite end of paperclip from a wire, rod or hook in an area of your garage or house that is well ventilated and out of direct sunlight. Bundles can take 4-6 weeks to thoroughly dry. Once dried let your imagination loose throughout the Fall and Winter crafting and decorating with your dried lavender.